This wonderfully precise cutting board offers diagrams for slicing exact measurements of cheese. Aunt Hildegard always wants "just a sliver" of pecorino. Cousins Brett and Judy agonize over a perfect 50/50 camembert split. You could dust off your high school geometry skills, or instead opt for this cutting board. 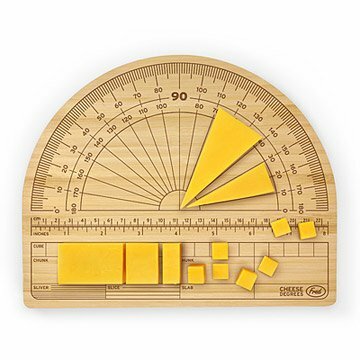 The solid bamboo surface is etched with a protractor for slicing cheese with mathematical precision, and includes templates for cutting block cheeses into various serving sizes. The host or hostess's ultimate party cheat sheet, this design will save you from a total cheddar meltdown. Made in China. Wash board with warm, soapy water. Rinse and dry thoroughly. Help condition and preserve your Cheese Degrees Cutting Board, once a month, with mineral oil. This is a great addition to my brothers math themed kitchen! I'm sure this cheese board will get lots of use! We used it with our friend to cut cheese in diffrenets sizes, we had fun! My brother in law is famous for slicing a chunk of cheese and sometimes you only want a little to appreciate the integrity of the cheese. He enjoyed the humor in the presentation of the cheese board.